By Ihsan Munir: This past Saturday, March 08, 2014, we witnessed a clash between Saul “Canelo” Alvarez and Alfredo “El Perro” Angulo. Both men were coming off losses, Canelo to Floyd “Money” Mayweather and Angulo to Erislandy Lara. This was a fight for redemption for both of them. Or was it? What many fight fans seem to forget about the sweet science is that often times the “science” is not seen in the ring or in the gym but in the boardroom. And this particular encounter is no different. Understand that the match-makers at Golden Boy were tasked with one thing and one thing only: to find a fighter who will make Canelo look good. Don’t buy into the hype that promoters sell that certain fighters aren’t marketable and that’s why they chose Fighter A over Fighter B. No! The reality of the matter is that Canelo equals millions of dollars for all involved. He’s young, good looking, insanely popular in Mexico and his fan base in the Southwest United States is steadily growing. Getting back to the “science” in the boardroom, it was important for Canelo to be in a winnable fight, where he can display his skills and look good. This puts him back in contention and back in the conversation about title fights. They can spin what happened September 14, 2013 as a young fighter losing to the best fighter in the sport – there’s no shame in it. But what we confirmed (not learned) on September 14th is that Canelo cannot deal with boxers. That is exactly why Golden Boy does not want to put him in the ring with Erislandy Lara; an extremely skilled boxer, nutured in the Cuban boxing program. Lara made Austin Trout look foolish in his last fight and would present a nightmare for Canelo. Canelo looked great against Angulo, who, by the way, just a few short years ago, was the golden child of Golden Boy. 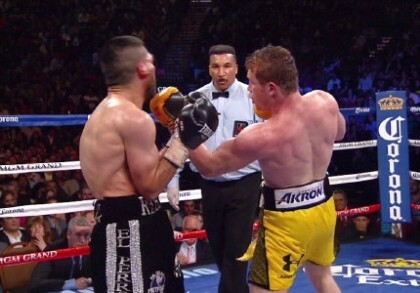 But Canelo was supposed to look good against someone like that. Angulo does not have any real defense. He is a slugger, without head movement and he moves like his shoes are made from cement. He was going to be right in front of Canelo all night, blocking his punches with his face, while winging punches of his own. Canelo is a skilled fighter. I would term him a brawler/boxer. He is not your typical Mexican fighter in that he does bob and weave, has an improved defense and shows off his boxing skills. However, he is still a Mexican warrior and will brawl with you. He was raised in the game fighting in Mexico against the brawlers who will stand in front of you and go toe to toe. That, however, is not boxing – the art of hitting without getting hit. That is fighting. What would make Canelo an improved fighter and a nightmare for most people would be improved footwork. So what did we learn Saturday night? Well, nothing new. Canelo is going to beat up on guys who stand in front of him; one dimensional fighters. However, he will struggle mightily against boxers. Mayweather made him look like a sparring partner and I suspect Lara would do the same. I also suspect that the head honchos at Golden Boy would agree with me, which is why we didn’t see Canelo vs Lara. There is too much money to be made by making that fight. However, they are willing to put him in front of James Kirkland, a one dimensional beast with a suspect chin and poor footwork. I will say, however, that Canelo’s stamina has been improving over his last couple of fights. If they can get his footwork up to speed (pun intended) then we will be looking at a force to be reckoned with. He is skilled, has good technical abilities, a fighter’s heart, and good power. He is a good fighter with even greater potential. We knew that prior to Saturday night. Let’s see what we learn in the future. Previous boxing news: July to face unbeaten Graves April 12!